*the influence of conservative think tanks on information citizens receive, especially concerning educational issues and policy. Schools or Markets? 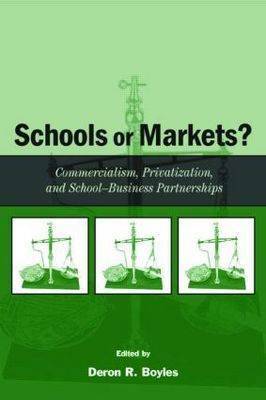 : Commercialism, Privatization, and School-Business Partnerships is compelling reading for all researchers, faculty, students, and education professionals interested in the connections between public schools and private interests. The breadth and variety of topics addressed make it a uniquely relevant text for courses in social and cultural foundations of education, sociology of education, educational politics and policy, economics of education, philosophy of education, introduction to education, and cultural studies in education.